Samsung is said to be working on an Android Go phone and it is heading to India and other neighboring countries. Last month, a new entry-level Samsung device surfaced on Geekbench with a quad-core CPU, 1GB RAM and Android 8.1 Oreo pre-installed. This means that the handset might run the slimmed-down Android Go OS. This new phone might be launched under Samsung’s Galaxy J series and it is rumored to be called the Galaxy J2 Core. However, there’s no official confirmation about the name just yet. According to the SamMobile’s report, it’s pretty much confirmed that such a device is in the works and it will be launched in the Indian subcontinent. The benchmark listing of the Samsung SM-J260G gave enough clues that it will be based on Android Go. The device was listed with 1GB of RAM, a processor codenamed Universal7570_Go, and Android 8.1 Oreo. This is a major indication that this is likely an Android Go device. Samsung normally uses Tizen processor for devices with 1GB RAM, however, that is only optimized for smartphones that don’t run Android. 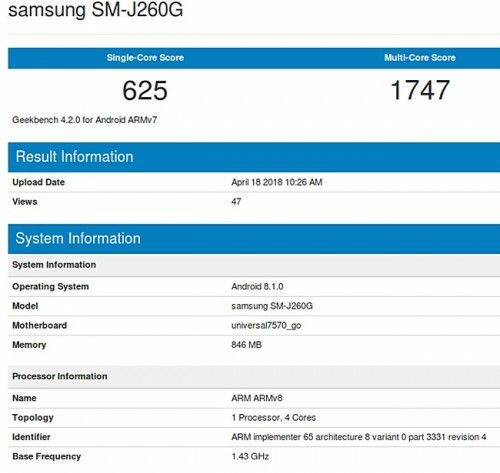 So, this new processor appears to be an optimized version of the Exynos 7570 with four ARM Cortex-A53 cores at 1.43GHz. Samsung launches many of its budget offerings in countries including India, Nepal, Bangladesh, and Sri Lanka. India, however, has become increasingly difficult to go head to head with competitors like Xiaomi for Samsung. So, it’s not surprising that the Korean giant is focusing its Android Go phone in India. Announced last year, Android Go is a trimmed down version of Android Oreo that’s specifically meant for entry-level devices. It brings the best features of Android that can even run on devices with less than 1GB of RAM.